Pete Gostelow rode twenty thousand miles across Africa and passed through dozens of countries. In doing so he showed that the bicycle is the best way to travel. In this episode we continue our ride to Battersea Park and talk along the way about where he slept, what he ate, what his motivations were for making the journey and what it’s like to be back home after such a long trip. Pete also explains the inspiration he thinks ordinary cyclists can take from his long African adventure. This is the first of a two-part feature. Listen to part one. As November brings cold, dark cycling conditions to Britain, there’s no better time to get out the maps and start dreaming up adventures for next year. How about 20,000 miles across Africa? That’s a journey recently completed by Pete Gostelow. After crossing the Sahara, the Congo and the Namibian badlands, will Pete survive the mean streets of south London in a rolling interview? This is the first of a two-part feature. On the eve of the summer edition of the People’s Grand Tour, Jack goes for a spin around the back lanes of rural Hertfordshire with cycling journalist Lionel Birnie, a regular guest on The Bike Show, who writes about professional bike racing for the Sunday Times and Cycle Sport magazine. The People’s Grand Tour is open to anyone willing to commit to riding at least ten days over a 23 day period, starting this Saturday 11 August. It’s free to enter and a great way of increasing the amount of riding you’re doing. Our ride took in Ivinghoe Beacon, two punctures and ended with a coffee at The Hub, a fantastic new cycling cafe in Redbourne. Coventry has a very good claim to be the birthplace of the modern bicycle, the “Rover Safety” invented in the 1880s by John Kemp Starley, one of the city’s many bicycle makers. Someone very happy to make that claim is Steve Bagley, Head of Collections at the Coventry Transport Museum. We go for a ride around the city and a trip back in time. The museum has an excellent programme of cycling-related talks and exhibitions this summer. Music buffs will know that Coventry’s great contribution was the “2 Tone” ska revival scene of the late 1970s, led by The Specials and The Selecter. And do make a date for Velonotte, a night time architectural themed night time bicycle tour of the City of London and the East End, on the night of Saturday 23rd June through to the early hours of Sunday morning. More information at the London Festival of Architecture. 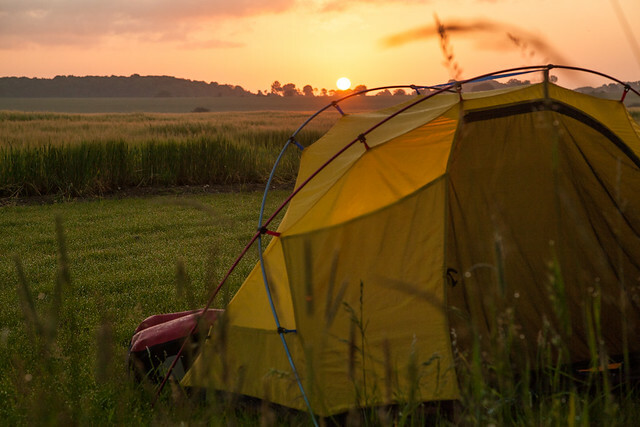 On a Midsummer’s Night Dixe Wills, travel writer and author of a new book on Britain’s tiny campsites, guides us on a ride from central London up the Lea Valley to a wild camping spot for a ‘sub twenty four hour overnight’. Various pitfalls ensure that little goes to plan. The new Bike Show jersey is unveiled and – in a podcast only bonus – Andrew Neather of the Evening Standard explains why the newspaper came out for London’s cyclists. Jenny Jones is a member of the London Assembly and is standing as the Green Party’s candidate in the 2012 London Mayoral elections. We ride from her home in Walworth/Peckham borders to City Hall and discuss cycling, liveable cities and the future of the Green Party.